I first learned of Arrowhead Spring Vineyards a few years ago when I was shopping for wine at Empire State Cellars, a wine shop in the Tanger Mall in Riverhead, Long Island (since closed). Asking if I was interested in trying something new and unusual, I of course said yes and was immediately directed to a section of the shelves that displayed a Pinot Noir from the Niagara Escarpment in Northern New York State. It was only $17 so I thought, “What the hell can I lose by trying this?”, for though I trusted the recommendation I couldn’t help but be skeptical. After all, I’d never heard of the Niagara Escarpment. It certainly didn’t sound promising. The Pinot Noir, a 2009, utterly took me by surprise, with its aroma and flavors of red fruit (especially wild cherries), tobacco notes, already integrated tannins, balanced acidity and the promise of depth that should evolve over the next three to four years; a sapid, well-made wine with real typicity, as good a Pinot as any I’d had from a New York winery. It was also very good value. As a result, I began following this winery for a couple of years. 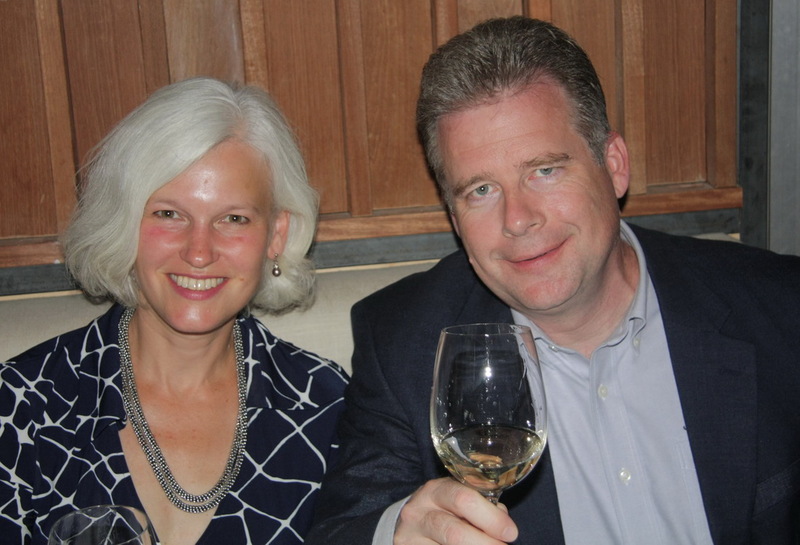 Then, this past June my wife and I went to a dinner held at The Riverhead Project, a Long Island restaurant, at which the owners of Arrowhead Spring were being honored with a dinner sponsored by Empire State Cellars. As it happens, Vals and I were seated with Robin and Duncan Ross, the owners, and regaled with an excellent dinner by Lia Fallon Stanco accompanied by their wines. I interviewed Robin at her vineyard in the Niagara Escarpment AVA on a warm August day in 2013 after spending a day in Ontario Wine Country on the other side of the Canadian border, which is to say, the Niagara Peninsula VQA, which includes part of the Niagara Escarpment that runs through there (and terminates some 500 miles to the West). Indeed, the Escarpment is a geological feature so vast and significant that it is worth some background before I proceed with the interview with Robin. Stretching nearly 700 miles in the shape of a sickle that extends from Wisconsin in the West across Ontario to New York State in the East, and encompassing over 480,000 acres, the Niagara Escarpment—in Canada—is a UNESCO-designated World Biosphere site. Essentially, it is the remnant shore of an ancient sea. Its name is derived from its most well-known feature, the Niagara Falls. An escarpment is a type of cuesta—a geological feature defined by an erosion-resistant caprock of dolomitic limestone overlaying fragile shale and other soils that was laid down nearly 450 million years ago. The result is that differential erosion undercuts the more vulnerable layers under the caprock so that the land slumps more on one side than the other, with steep slopes in some places and more shallow ones elsewhere, depending on the makeup of the layers of the underlying soil. In the vicinity of the Niagara River the collapse of the undersoil has resulted in the spectacular cliffs over which the Niagara falls. 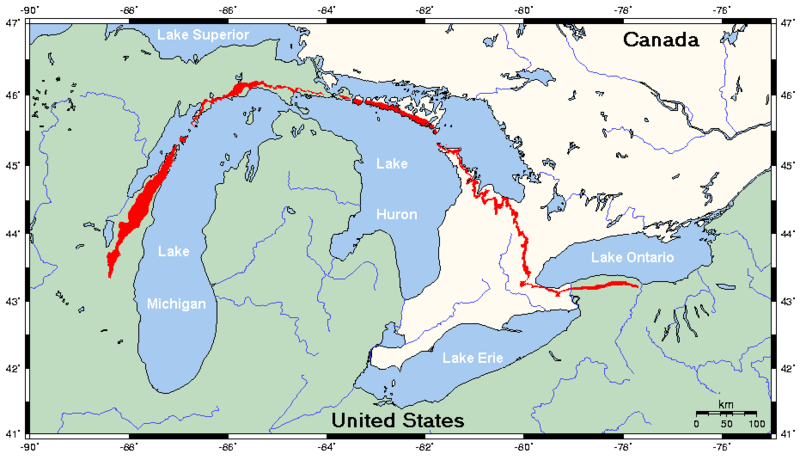 Because the Escarpment here runs along the south shore of Lake Ontario, there is a pronounced “lake effect” in which the cold air of winter blows off the caprock down to the water and warmer air from the lake rises to the upper layers of the Escarpment, depending on how the winds blow. The end result is that the Escarpment is warmer, overall, that any other wine-growing region of New York State, except for Long Island. The escarpment is home to two AVAs at either end of the feature—Wisconsin Ridge AVA (2013?) that runs along the Western edge of Lake Michigan and the Niagara Escarpment AVA (2005), which comes to an end near Rochester, NY. In between them are the Ontario VQAs—Niagara Peninsula’s Niagara Escarpment Region (which also includes the Short Hills Bench, Twenty-Mile Bench, and Beamsville Bench VQAs with a total of 22 wineries). New York’s Escarpment AVA (at 18,000 acres the third-smallest of the State’s nine AVAs) has been home to wineries since the mid-1800s. Since the 1990s six resident wineries have been establish in the Escarpment, including Arrowhead Spring, which was founded and opened in 2005 by the Rosses, the same year that AVA status was granted to the region. 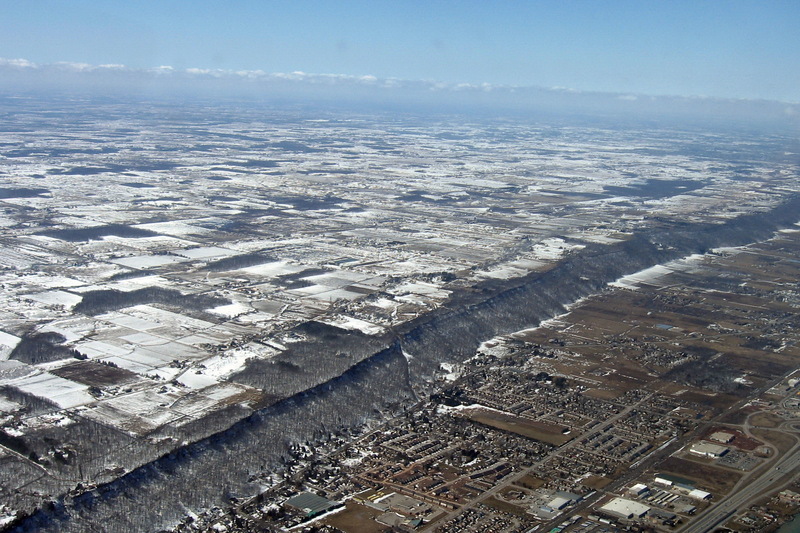 “The Niagara Escarpment is an uplift of bedrock that runs parallel to Lake Ontario in Niagara County. It’s about a 200-foot drop in elevation facing north, with slopes of one half to several miles long. The underlying rock is dolomitic limestone and – in our vineyard – we have springs where the hydrostatic pressure from the escarpment releases water. This results in a great mineral quality being imparted to the fruit, and wine. “The Niagara Escarpment also offers natural frost protection. Lake Ontario is a large heat sink and this powers wind towards the lake when the lake water is warmer than the air and away from the lake when it is cooler. Robin and Duncan had been in the software business, but after Duncan was laid off in a work-force “reduction” they decided to look at another lifestyle and, given their love for and fascination with wine, they decided to buy land in an area they knew and loved to grow wine grapes. At first they bought their fruit from vineyards in Canada and would have from the North Fork of Long Island, as they’d only planted their own vineyard in 2006. In fact, Robin recounted, she’d bought–and paid for–several tons of grapes in 2005 in advance of the harvest from Mudd Vineyards. It turned out to be bad vintage due to the weather around harvest time, and they got a check in the mail from Steve Mudd, who explained that the crop was lousy and he couldn’t keep their money in consequence. “You have to really admire and respect someone like that,” said she. Indeed, it was the Canadian winegrowers in the Niagara Peninsula, which includes the continuation of the Escarpment, who helped them with variety selection and advise about growing vines in a cool climate (albeit the second-warmest in New York State). Robin mentioned, in particular, Kevin Watson, of Watson’s Vineyard, in Niagara-on-the Lake, Ontario. When they began looking for a vineyard site they based their search on soil maps that laid out the soil composition of the area. Having come from a farming family, she knew what she was looking for and understood how to read the maps. Duncan and she were looking for land that didn’t have too much clay in the topsoil, and they knew that the dolomitic limestone that underlay the topsoil would be especially good for winegrowing. Since planting the vineyard in 2006 Robin has developed growing experience and knowledge that grows by the year. She still asks questions of Kevin Watson occasionally. Another person from whom she’s drawn inspiration is Barbara Shinn, of Shinn Estate in Long Island, whom she has found unstinting in helping her with advise and insights into issues of organic and Biodynamic viniculture. Syrah is one of the varieties that have been planted, and Robin remarked that the only problem that she has with it is the uneven berry size, but that has not had any effect on the quality of the wine made from it. The Syrah is on a Scott Henry trellis, which allows for two lines of fruit, one over the other, but they’ve been having some trouble with it this year, given that the season started very wet. The thing is, Scott Henry allows for two wires for fruit, one above the other. The lower line of fruit, however, can be covered over by very heavy foliage, which increases the disease pressure, especially from mildew. Despite regular leaf pulling, the foliage “grows gangbusters,” as Robin says, due to the varieties high vigor. When I asked her why they had decided that the particular mesoclimate of the vineyard, as well as soil and aspect (the terroir) was suitable for growing Syrah, she explained that while they are the first on the U.S. side of the region to plant Syrah, on the other side of the border there has been some success with the variety. One thing that is important to understand about Syrah is that once it reaches ripeness it must be picked or the berries will begin to desiccate. “If you have the grapes at 23º Brix and you hope to let them ripen to 25º Brix, forget about it, the grapes will start desiccating,” Robin warned. Given the vigor of the vines on the vineyard, before they can run a tractor through the rows for a Spring spray, for example, they first have to go into the vines and spread apart the tendrils that have intertwined, lest they get caught in the tractor. For ground cover the Rosses first planted clover for its nitrogen-fixing qualities, along with a broad-leafed orchard grass. They need to plant cover that would not be torn up by the tractor, given that soil erosion can be a problem in the vineyard, since parts of it are very steep, what with the amount of rain that they get there. They also planted rye, as it is so fast-growing, and one other fescue. Robin is especially pleased that so wild plants have germinated in the cover as well, such as dandelions, which have deep-tapping roots that bring nutrients up to the surface. One of the issues with farming a monocrop is that there isn’t much bio-diversity, which is something that one wouldn’t find in nature, so the diversity of the cover crop is important—for instance, in some of the alleys wild sweet-pea is growing, which attracts beneficial insects such that the pests are not a big problem in the vineyard. The thing is, when people drive up to the tasting room they pass the vineyard and they can see how the Rosses farm. It’s pretty obvious. Also evident are their chickens, which they keep “as a last line of defense” against insect pests. The chickens are kept in a fenced area because they would otherwise be lost to predation. In a bug-heavy year they do let them loose in the vineyards where they are especially effective against Japanese beetles. As Robin explains, “I rise at sunup and go shake the vines, and as the beetles don’t yet fly in the morning they fall on the ground and the chickens would eat them.” This way they can have a few vines done one day and another few the next day and so on. To do this, they invested in a mobile chicken house that can be towed behind the tractor—not a unique idea, farms with other crops may use one, but new to NY vineyards, I suspect—so that they can get the chickens to range where they want them to. 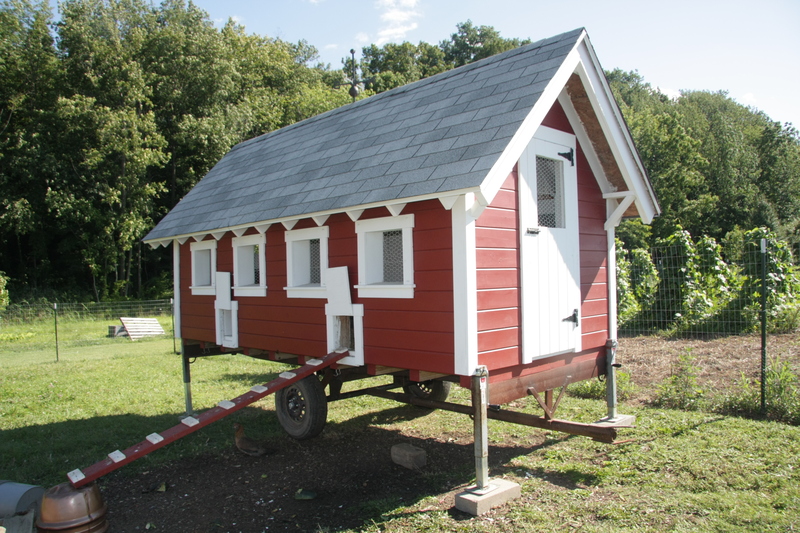 The only problem is that though the chickens are very effective at eating bug pests, if the coop is moved too far to the next place they often go to the last location they remember coop had been set, so they need to be directed to where the coop has been moved. Sometimes at night she can be chasing the chickens around the vines—some of them will roost in the vines— which can take some time, so it can be very frustrating sometimes. For mammalian pests like rodents and raccoons they have hawks and owls that nest and roost around the vineyard. The vine rows not only run along the Escarpment North-South, which means that the northern rows catch the sun at an advantageous angle but also towards the West, as the Escarpment has a shape not unlike an aircraft wing, with a sharp slope forward from the apex, and a shallow slope from there back to the trailing edge. Here the trailing edge slopes to the West and catches the afternoon sun. It makes for interesting driving on the tractor. When I pointed out that in Long Island bird netting is used predominantly, she responded that one of the advantages of their site is that there aren’t a lot of power lines on which birds can roost. In fact, towards the tree line behind the vineyard there are many birds of prey and the hawks also helping discourage birds from going into the vineyard. I also mentioned how Carol Sullivan, owner of Gramercy Vineyard, has a dog that takes care of the raccoons that can decimate a vineyard; Robin told me that they once had a dachshund that had the same effect of driving raccoons away. They now have a border collie, Ian, that does the same thing. “In fact,” she said, “just the other day I saw him chasing a skunk. He’s learned his lesson because last year he got sprayed by getting too close, but now he keeps about twenty feet away, but he continues to go after the skunk until it disappears into the tree line. . . . As far as rats, mice, moles, we have an army of three cats, so from the bodies I find I can tell that they’re quite successful.” Indeed, Robin hasn’t seen any raccoons in the vineyard since the dachshund first went to work. The varieties that they grow on their property include Chardonnay, Cabernet Sauvignon, Cabernet Franc, Merlot , Malbec, and Syrah. They make a Meritage wine from a blend of their red Bordeaux varieties. All the varieties’ vines are spaced at 8’×4’6″. The grapes for the Pinot Noir that I mentioned that I like so much they buy from a vineyard five miles to the West on the Escarpment. While most of the vines are on Scott-Henry trellis, some, like the Merlot, are clearly not doing well on it, so Robin is converting the Merlot over to VSP, because the variety isn’t not particularly vigorous, and Scott Henry is meant for vigorous growth. The Cabernet Sauvignon is already on VSP trellises. 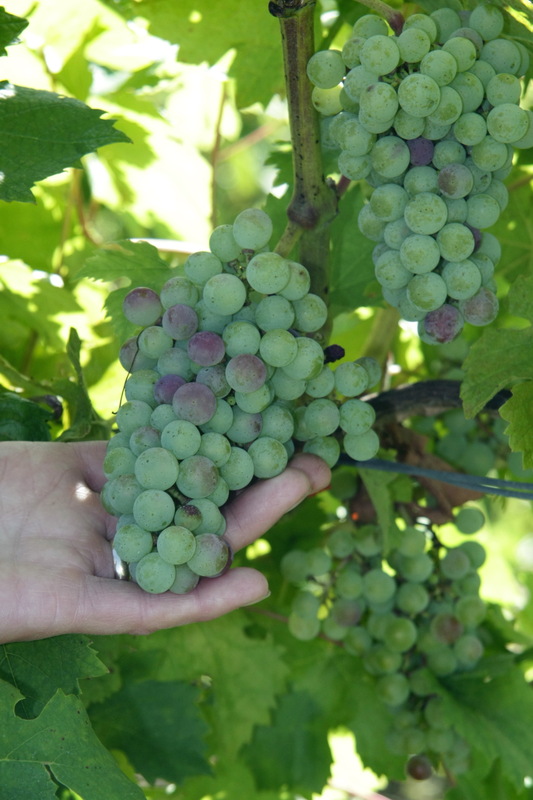 Cab Franc grapes at the beginning of veraison. Last year the Cabernet Sauvignon hit 26° Brix and was picked in October, the day that the first frost came to the vineyard. Typically they harvest the Cab Sauv and Cab Franc around November 4th. That they can pick so late is due to Lake Ontario, which, given its enormous size, is a heat sink that provides a long autumn for the vineyard, which lies about eight miles away. The lake is, in fact, a body of water even larger than Long Island Sound, and it also provides an early spring, thus prolonging the growing season. The issues with the Malbec have led to discussions about what to do about it. Part of the problem is that it has been planted on an edge of the vineyard where it catches a lot of wind, which it apparently doesn’t like—it’s too rough. Even the Cab Franc doesn’t care much for a lot of wind, but it’s terrible for the Malbec. If Robin were able to do it over again, she’d plant the Malbec in a more sheltered location and move the Syrah to less vigorous soil and replant the less vigorous Cab Sauv to where the Syrah is planted now. Grafting is an alternative to planting new vines, but she’s leery of grafting because it is prone to go badly if people don’t know what they’re doing—even grafting houses have graft failures. As we were walking the vineyard we came upon a patch of stunted vines where, it turned out, in 2007 a neighbor had been applying herbicide in his field in preparation for planting corn. Apparently the spray boom hit a rock and lifted, pouring spray into the vineyard, wiping out a number of their vines. The vines have still not recovered, with many killed and the rest have not recovered, as she’d hoped, even to this day. When I asked her about whether or not Arrowhead had received compensation, she said that she turned the offer down—she’d rather have good-neighbor compensation: were she to need help, they’d be more likely to lend a hand. When they next buy new vines for the vineyard, they’ll replant this patch. As it happens, after such a bad beginning to the season, the harvest on the Escarpment, including for Arrowhead Spring, was very good indeed. By October 28 they had harvested seven tons of Cab Franc from a two-acre parcel—that’s 3.5 tons per acre on Scott Henry, which makes possible from 3 to 4.5 tons per acre; a lot of grapes. In fact, it was good on both sides of the Niagara River. We can look forward to some excellent wines from that part of New York and Ontario for 2013. 87 points from Wine Spectator Magazine. Highest scoring Syrah from New York State in the history of the magazine. 89 points from Wine Spectator Magazine. 92 points from Wine Spectator Magazine (highest in New York). 86 points from Wine Spectator Magazine. 90 points from Wine Spectator Magazine. In fact, Duncan first won a prize for his 2002 Pinot Noir, made years before he and Robin had purchased the vineyard or built the winery. An inspired amateur then, who has since become a dedicated professional, along with Robin–his partner in wine–she runs the vineyard with considerable skill and aplomb, learning as she deals with each season, with some help from a dog, an army of cats, an occasional owl or hawk, and a very small but hard-working staff. 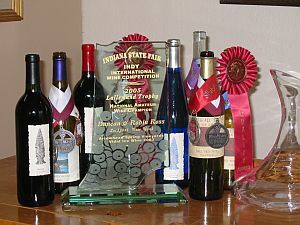 2005 Gold – WineMaker International Amateur Wine Competition. American Wine Society Quality Award. “BeauVine Vineyards LLC in Lockport is spending $1.3 million to add a 14,000-square-foot grape processing/retail facility, new harvesting equipment and purchase nearby land for more farming. 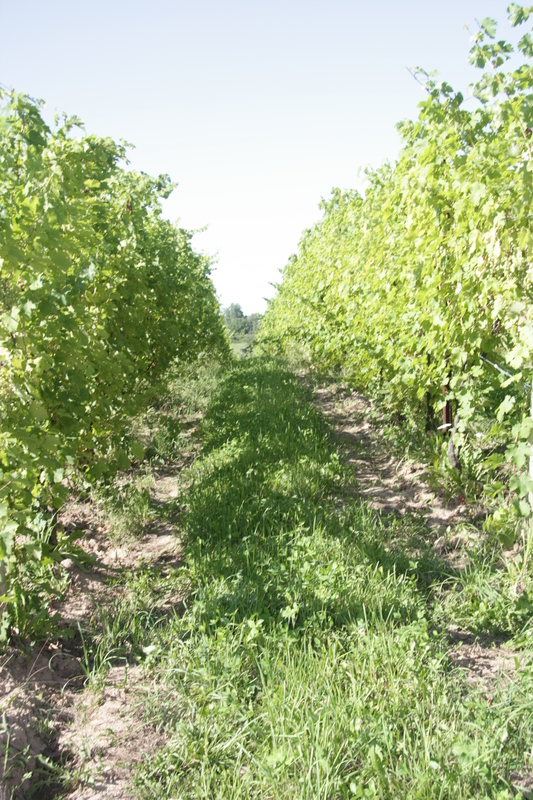 Beauvine Vineyards, on the Niagara Escarpment, primarily provides grapes to Arrowhead Spring Vineyards Winery. Both are owned and operated by Robin and Duncan Ross. “Plans call for expanding juice production not only for its own use, but also for other wineries on the Niagara Wine Trail and in other parts of the state. “In addition to crushing grapes for its own wines, the production equipment will be available by contract for other growers who need their grapes crushed on a custom basis, or those who want to buy bulk juice to finish at their own facility. The vineyard is also buying new harvesting equipment with help from a $370,000 grant from Empire State Development through the Western New York Regional Economic Development Council. “The project supports growth of the wine sector in Niagara County, where more than 20 wineries make up the Niagara Wine Trail. The ESD grant will pay for harvesting equipment, which will also be available for lease to other vineyards in the region. “Arrowhead Spring Vineyards . . . has acquired 23 acres of additional land just a half-mile west of its property on the Niagara Escarpment, doubling its size as part of a larger $1.6 million expansion that includes vineyards and a new facility. . . . It bought the land at 5126 Lower Mountain Road in Cambria from the Cornell Cooperative Extension in Lockport. Cornell had received it from George Kappelt of Flavor Farm, a produce grower for restaurants in the Buffalo area. The purchase price was $80,500. “Duncan Ross, who co-owns the vineyard with his wife, Robin, said they plan to “prepare the land for planting in 2017, and then begin planting in 2018,” reflecting a typical two-year advance period for vineyards. “The purchase comes just after Arrowhead finished planting its current 23 acres with a mixture of Chardonnay, Syrah, Cabernet Franc, Pinot Noir, Merlot, Cabernet Sauvignon and Tempranillo grapes. Arrowhead Spring Vineyards interview with Robin Ross, 14 August 2013, updated 5 November 2013; added material on 10 August, 2016. This entry was posted in Vineyards, Viticulture, Wineries and tagged Arrowhead Spring Vineyard, Biodynamic Viticulture, Duncan Ross, Kevin Watson, New York State wine, Niagara Escarpment AVA, Niagara Escarpment VQA, Niagara-on-the-Lake VQA, Organic Viticulture, Robin Ross, Scott Henry trellis, Steve Mudd, Sustainable Viticulture, Watson's Vineyard on 10 August 2016 by JoseM-L.